Amazing recipe for Breakfast Zucchini Pancakes. Grated zucchini in an egg mixture with a ham and cheese filling. 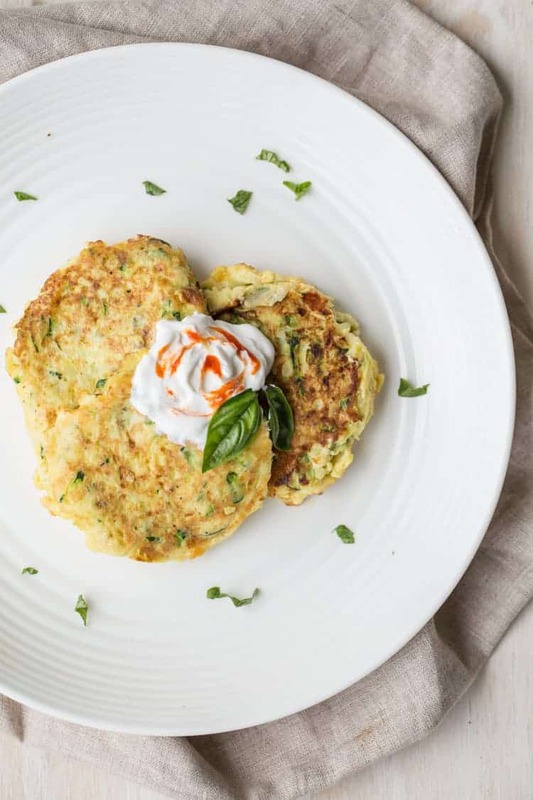 The zucchini pancakes are ready from start to finish in under 30-minutes and are a great treat for your family when you want something a little more than average for breakfast. The whole family will approve, even the picky eaters. 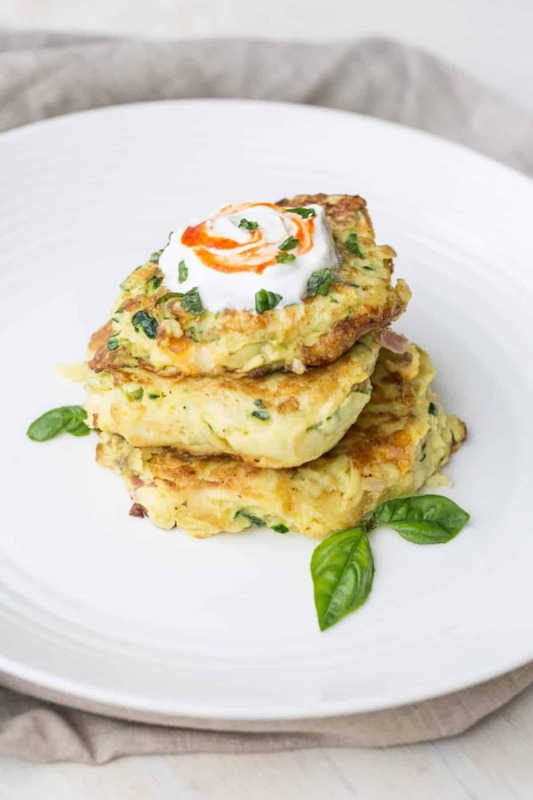 Try our Zucchini Fritters Recipe. Breakfast is by far my favorite meal of the day and is my favorite meal to prepare. Kiddos are more into the cream of wheat, oatmeal, or milk soup with angel hair pasta but my hubby and I prefer a great sandwich with eggs, omelet or these delicious zucchini pancakes I am sharing today. I cannot begin to explain how amazing this recipe is. The zucchini cooks through just enough to become tender but not mushy and adds so much flavor to the eggs. The center of fritters oozes with melted cheese and ham. Insanely delicious! How to make zucchini pancakes? Grate zucchini on a grater. Tip: Be sure to remove any excess liquids from grated zucchini. Prepare egg mixture, add grated zucchini. Mix. In a large skillet, heat oil. 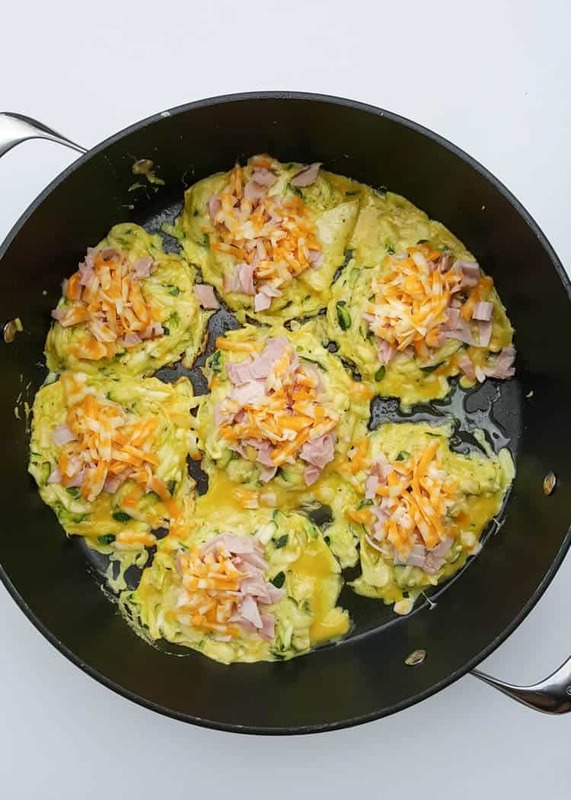 Add some zucchini egg mixture to pan, add ham and cheese, cover tops with more zucchini mixture. Cook zucchini pancakes, carefully flipping halfway through cooking. What kind of cheese goes into zucchini pancakes? Your favorite cheese may be used: Four cheese, Mexican or Colby Jack work best, Mozzarella will also work just fine. TIP: Purchase blocks of cheese and grate the cheese yourself. It tastes so much better, is less expensive and has fewer additives to keep the cheese fresh. You’re welcome. 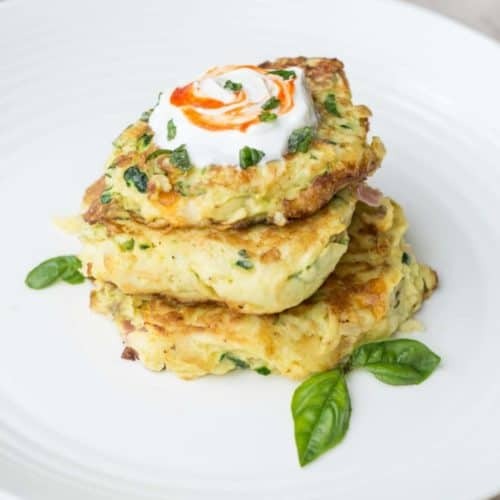 What to serve zucchini pancakes with? Enjoy zucchini pancakes with a dollop of sour cream. I love myself some sriracha or hot sauce, just takes all foods to a whole new level of awesomeness. So, I enjoy my breakfast fritters with sour cream and a lovely touch of hot sauce. Grater-The best way to grate the zucchini in this recipe. Skillet-Perfect to the fritters on! Slotted Spatula– Great for flipping the fritters. These breakfast zucchini pancakes will become a family favorite! 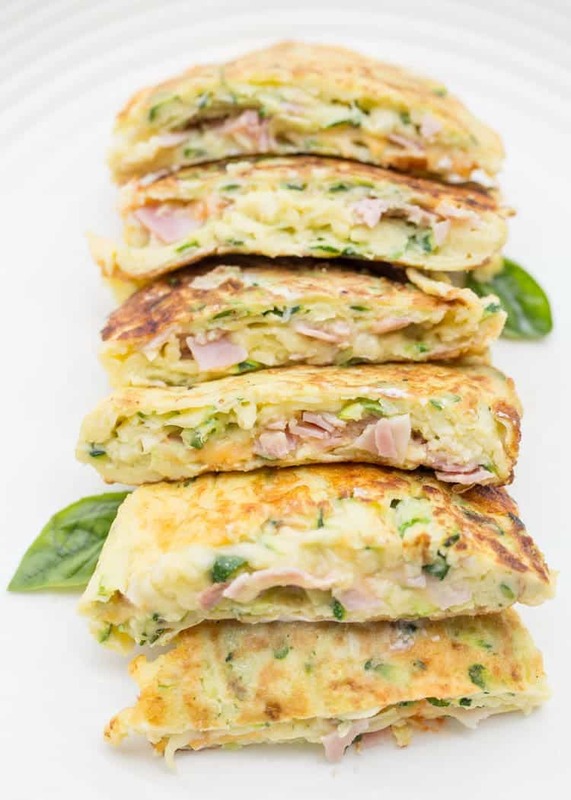 Grated egg and zucchini pancakes mixture with a ham and cheese filling. Grate zucchini on the coarse side of a grater and squeeze grated zucchini to remove excess moisture. Lightly whisk eggs. In a bowl, combine grated zucchini, eggs, garlic, flour, and pepper; mix well. In a non-stick skillet, over medium heat, heat oil (just enough oil to lightly cover the bottom of skillet). Once the oil is hot, scoop mixture onto pan. Repeat until skillet is full. (I used 2 skillets at the same time so all cooked together). With a spoon, gently distribute mixture evenly. Add some ham and cheese to each fritter. Then, add more egg mixture to close the patty so the ham and cheese are covered. Cook 3 minutes, carefully flip patties and cook another 3 to 4 minutes. Serve immediately. I just made these. Made 6 bigger fritters and cooked them through but when I sliced one it was still a little gooey inside. I’ll stick them in the oven to cook the I side more. Dont want to burn them by returning to the pan. I’ll have to make them a little thinner next time. Fritters are pretty good for a delicious breakfast! Zucchini fritters are my absolute fave! Going to save this for when the zucchini is plentiful next summer! Jessica, it will depend on the size of the zucchini 2-3 medium sized. 🙂 Enjoy. Ha! Thanks for sharing. 🙂 Bet it would be great with a side of hash browns – yummm! Wow these looks AMAZING. Trying them before church tomorrow. ?? We are zucchini galore here too. Can’t believe I missed that zucchini bread you have. Trying that next week. Thanks so much for all your recipes. ? I’m so glad you are tempted. Just wait until you try them!! SOOO good.